I am married to a cook. Joe loves to come home after a day in the field and fire up the grill. He forms his grassfed hamburgers by hand, insists on using the freshest ingredients in all recipes, and always has health in mind. Lucky me. Every morning he makes us smoothies that carry me through until lunch. It’s a tasty, nutrient-rich drink that takes just minutes to make (even less if you’re not the one making it!) The result is a delicious on-the-go meal that feeds body and soul. Thank you, Joe, for keeping us healthy and well-fed. 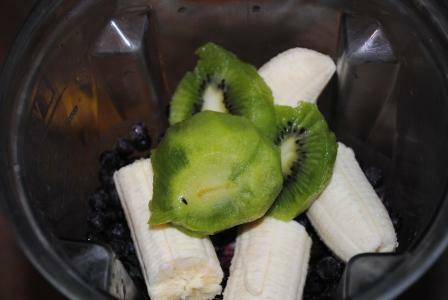 Place all ingredients in a blender*, mix, pour and enjoy. It’s that easy … and that good! 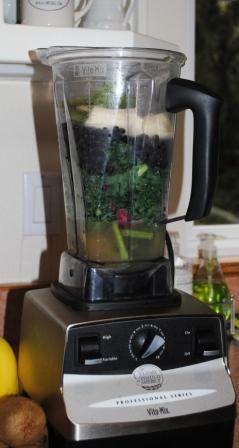 We invested in a Vita-Mix Professional Mix series blender last year and it has been well worth it. It also makes sauces, soups and just about anything else you need to chop, puree, blend or mix.